When the time came for pioneer Duluth pharmacist Max Wirth to build a new headquarters for his business in 1886, he didn’t have a tough decision to make as far as which architect to hire. Max’s brother George was at the time one of the best-known architects in Minnesota, designing many prominent buildings in St. Paul and Duluth, include Duluth’s 1883 Grand Opera House. In 1884, George Wirth formed a partnership with his Duluth construction superintendent, Oliver Traphagen. Together the pair created a brownstone masterpiece that would serve as the home of both Max Wirth’s business and his family—and today once again acts as both the residence and workplace of its owner. A native of Bavaria, Germany, sixteen-year-old Max Wirth immigrated to the United States in 1869 and landed in Utica, New York. He made several return trips to Bavaria before moving to St. Paul in 1879. It was a risk: Duluth was fairly stagnant at the time, still reeling from the economic losses created by the Panic of 1873. But things were looking up as the Red River Valley was beginning to produce the crops that would turn Duluth into a major grain-trading center. Wirth first set up shop on the “southeast” corner of Lake Avenue and Superior Street, site of the Minnesota Power Plaza today. By the mid-1880s, Wirth—as well as the rest of Duluth—was enjoying significant growth. The grain trade was booming, Duluth had become a center of timber production, and its brownstone quarries were busy filling orders from the country’s major cities as heavy Romanesque Revival buildings were the fashion of the day. The population jumped and Wirth’s customer base was expanding along with it, as was his family: that year his wife Louisa gave birth to a daughter, Pansy, joining her older brothers Adolph (b. 1879) and George (b. 1882), both named after two of Max’s brothers. Max and George Wirth had another brother, Carl, who was a prominent architect in Superior, Wisconsin, and designed many of the city’s 19th-century school buildings. Max Wirth purchased the lot at 13 West Superior Street—a prime location, just west of Silberstein-Bondy, then the city’s top dry-goods store and also designed by George Wirth. The construction firm of Meining & Yager won the masonry contract, putting a face on the timber framing erected by carpenter Iver Wisted. When complete the building was 25-feet wide by 90-feet deep and three stories tall. It stood on a granite foundation and was faced with brownstone taken from Crowley’s Quarry in Fond du Lac with limestone trim. While the original first-floor façade is long gone, today the second and third floors retain their original elements, including the building’s unique, non-symmetrical second level, with a large bay protruding on the left side contrasting with massive, arched stonework surrounding a deeply recessed window on the right. The third floor features four Gothic-style windows below a traditional triangular gable that contains a brownstone medallion with the construction date—“1886”—carved in relief. The Duluth Weekly News declared the building “a model of elegance” and noted that the building contained “a system of skylights that is a great improvement upon any lighting system yet in vogue in Duluth.” The same year the Wirth building went up, George Wirth went home. He returned to Bavaria to live out his days. In Duluth, his former foreman Oliver Traphagen became Duluth’s premier architect, winning prized commissions until he himself left Duluth in 1896. The Wirth Building is the only remaining building designed by Wirth and Traphagen that still stands in Duluth today. The pharmacy operated out of the first floor and the family lived on the third; both boys would become pharmacists like their father. The second contained offices which were rented by realtors when it first opened, including the firm of Frisbee and Graff. 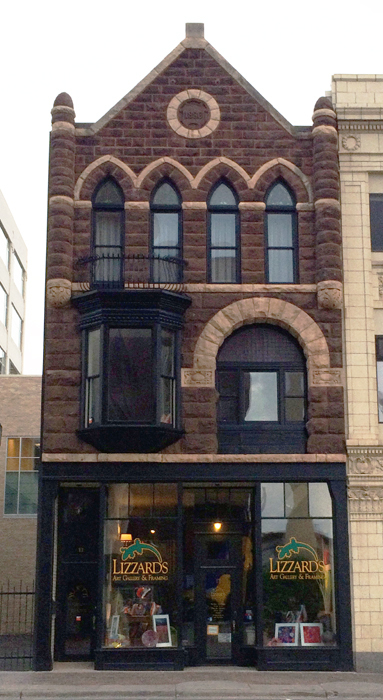 The second floor would later contain offices of dentists and a barber, and from 1902 to 1910 it was home to Duluth’s first female physician, Dr. Mary Knauf McCoy. By 1892 Wirth’s business was known as the “Eagle Pharmacy.” He employed five assistant pharmacists and operated the largest prescription service in Duluth. Max Wirth’s pharmacy would serve Duluth from that location for nearly 45 years. Louisa Wirth died of cancer of the gall bladder in 1915, when she was 60 years old. Max continued on until 1932, and his sons kept the pharmacy open until 1940. In 1950 the Wirth family sold the building. The top two floors became a boarding house, and the Tru-Value Dress Shop occupied the first floor until 1962. The Caribe Café, operated by Al and Millie Overlie, moved in after that and stayed until 1980. Other restaurants tried to make a go in that location and in 1986 it was the local headquarters of Michael Dukakis’ presidential campaign, but the building remained mostly vacant through the decade. In 1991, while the renovation was still in progress, the building was placed on the National Register of Historic Places. In 2002 readers of the Duluth News Tribune voted the building among Duluth’s top ten historic structures for its architecture. The first floor became home to an antique store and is now home to Lizzard’s Gallery. And today, just as Max Wirth once did, owner Bud Darling both lives and works out of the Wirth Building.